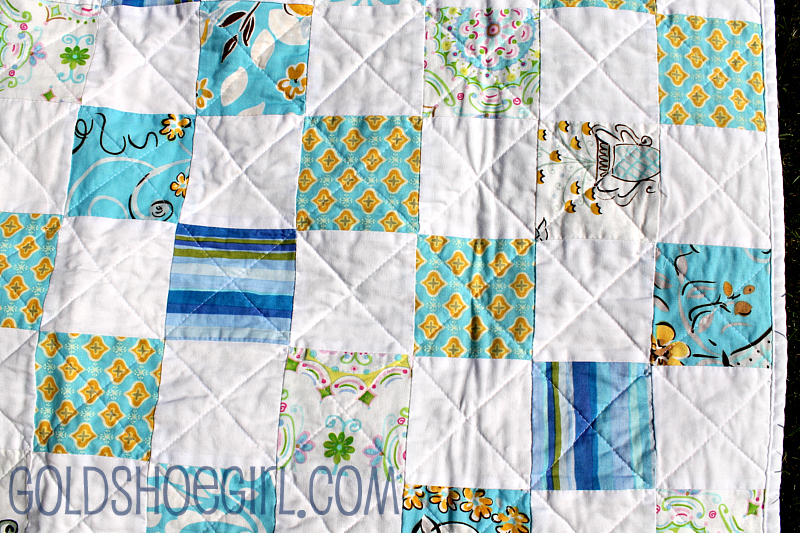 This is my second quilt. I cannot believe how easy these are coming together. It's so nice to do something besides curtains, pillows, and doll things. 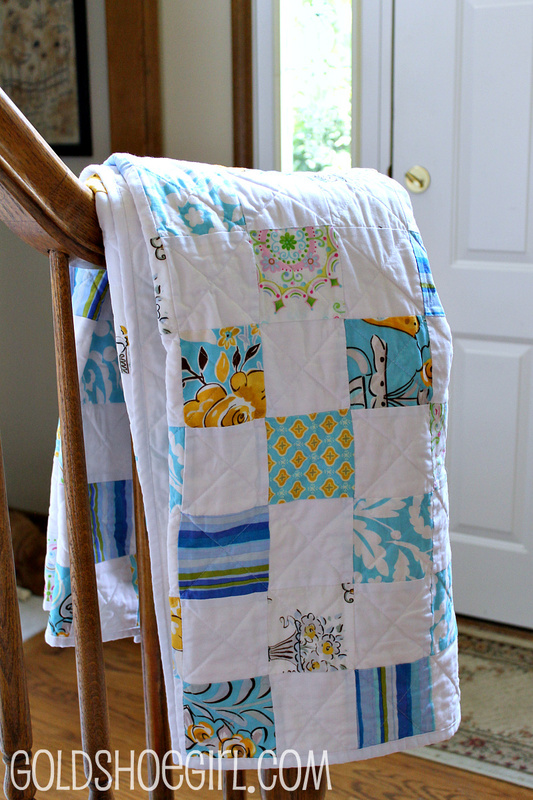 The print fabrics are Tea Garden by Dena Designs. I bought them on etsy. 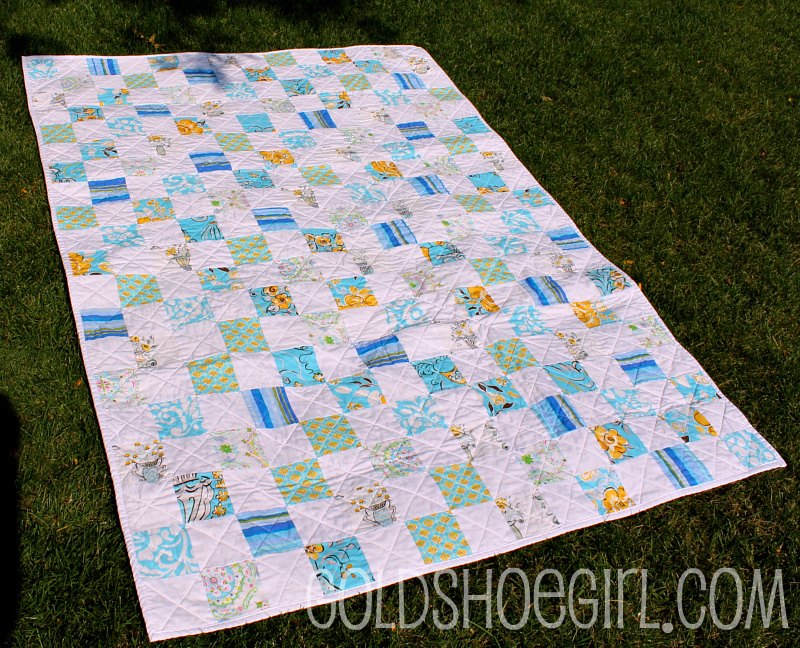 I used a white sheet set from Target to make the front side squares and the backing. At the time it seemed cheaper than buying white fabric but then the other day I got a ton of premium white muslin at Joann's with a 50% off coupon that would have been cheaper than a sheet set. All I did was cut 4" squares out of both my print fabrics and my white fabric. Then I sewed them together going print white print white. I had 7 prints so I did each row using 7 prints and 7 whites. I was careful to make each row different. When I was done with the top I was not sure I liked it but quilting it made all the difference. Now I love it. I did a simple diagonal stitch making an X across each square. At first I marked my lines with a disappearing ink marker but that was taking forever and it was really easy to just sew the lines without marking it first so I quit marking it after a few rows. It ended up about 60" x 70" so it is perfect lap or picnic blanket. Right now it is hanging out on the back of our couch looking all summery and light. If you look closely you can see some imperfections but I think the way the fabric crinkled up after washing hid most of my errors. 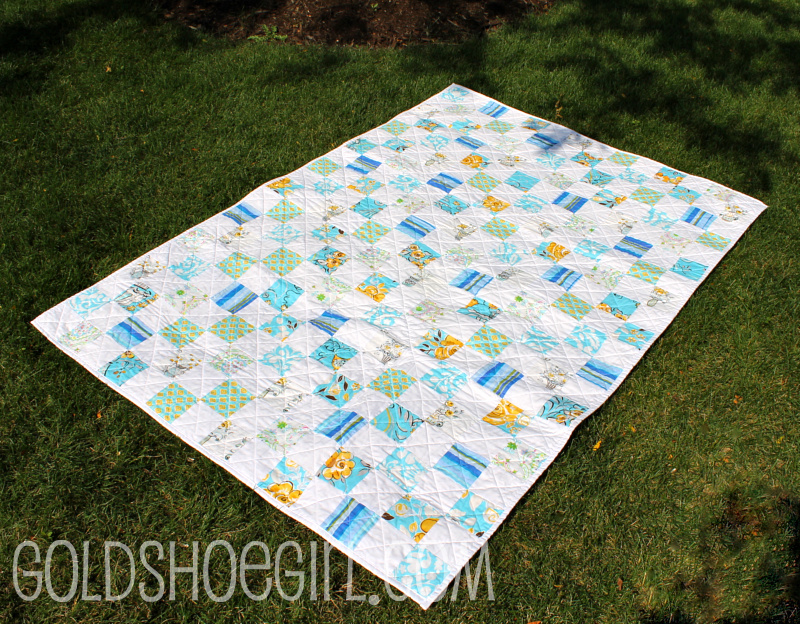 I am following the advice of all the quilting bloggers and not prewashing my fabrics anymore. I like the slight shrinking effect and I hate waiting for my fabric to get through the washer and dryer. Plus I have enough laundry to do without adding to it with quilt fabric. So now I am in the middle of a quilt for my daughter. I am using Riley Blake's Dress Up Days in the purple colorway for the top and backing. I have finished most of the cutting and have started piecing it together now. I'll share more as soon as something is picture worthy.